Beach Wedding Orange Beach: 7 Reasons to Choose a Beach Wedding! 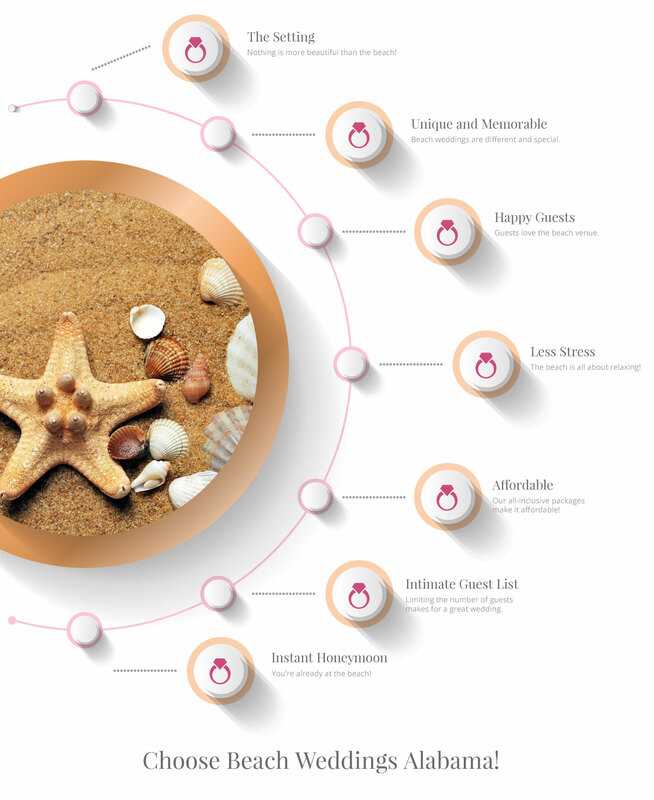 7 Reasons to Choose a Beach Wedding! Are you looking for a great venue to hold your wedding? Do you love the idea of a unique, beautiful backdrop that will wow your guests? You need to consider a beach wedding! Beach Weddings Alabama is proud to offer wedding packages that can fit every need and budget, while giving you an event to remember. 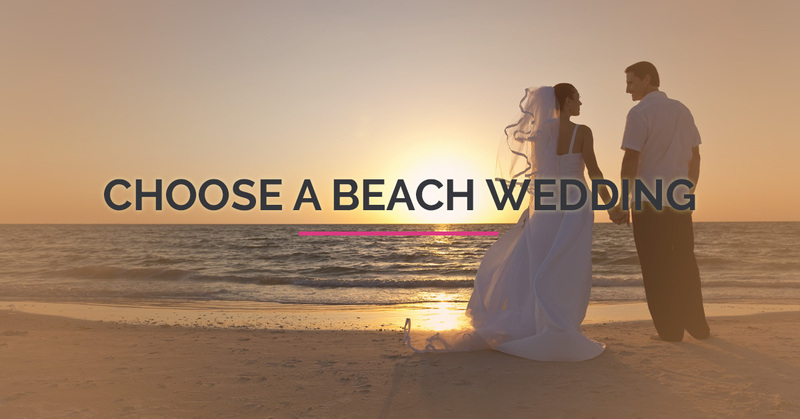 Read on to see if a beach wedding is right for you! The number one reason to have your wedding on the beach is the beautiful backdrop. You can’t create something more spectacular to stand in front of than the ocean, and the sand, waves, and sun come together to perfectly complement your ceremony. The beach is also incredibly romantic, and lends itself perfectly to weddings. Everyone wants their wedding to be a special, unique event that really impresses their guests and gives them memories for a lifetime. A beach wedding will definitely leave a great impression, and the photographs will be amazing! If you want a different, unique venue, you need to consider a beach wedding! Your guests will love the beautiful setting, but they also will appreciate the vacation at the beach. A beach wedding is the perfect time for families and friends to come together in a location where there is so much to do and explore. Everyone will be happy and relaxed when the wedding is at the beach! Beach weddings are inherently less formal, and this takes away a lot of the stress of a traditional wedding. The beach is also relaxing, and will get the whole wedding party in a peaceful mood. Beach Weddings Alabama offers all-inclusive packages that take the work out of planning your wedding. Let us take care of everything on your special day! A beach wedding can be extremely affordable, especially considering the atmosphere is already taken care of! The dress code can be more relaxed and casual, and the beach lends itself perfectly to a less formal vibe. You can stay near your venue at a beach house, be close to all of your family and friends, and save money at the same time! Beach weddings tend to be smaller, more intimate affairs, and this can really make your wedding great. If you are overwhelmed with the thought of hosting hundreds of people, and trying to talk to everyone during your reception, you may love to have a smaller beach wedding. Because there are fewer guests, everyone can spend more quality time together. Travel somewhere else for your honeymoon if you want, but when you are already at the beach there is no need! You are already in a great place to have a relaxing, romantic honeymoon when you get married at the beach. A wedding can be stressful enough, planning a honeymoon on top of it can seem overwhelming. A beach wedding allows you to stay where you are for your honeymoon, in a beautiful location! Convinced yet? A beach wedding is wonderful for so many reasons, and when you choose Beach Weddings Alabama you are getting wedding planning expertise that can make your day easy and stress-free. We can handle the flowers, food, decorations, photos, and music! Take a look at our great wedding packages and start planning your special day!